What Was the First Movie Ever Made? HomeHistoryWhat Was the First Movie Ever Made? If you’re a movie fan, you’ve probably wondered, What’s the first movie ever made? This is a great question, and a somewhat complicated one. In the late 1880’s various people began experimenting with photo, blending them together to give the illusion of a motion picture. But the technology and difficulty to capture that sort of video made motion pictures rare. This groundbreaking motion photography was accomplished using multiple cameras and assembling the individual pictures into a a single motion picture. it’s something that you could do today, using a few cameras that are set to go off at an exact moment. The movie was made to scientifically answer a popularly debated question during this era: Are all four of a horse’s hooves ever off the ground at the same time while the horse is galloping? The video proved that they indeed were and, more importantly, motion photography was born. The world’s earliest surviving motion-picture film, showing actual consecutive action is called Roundhay Garden Scene. It’s a short film directed by French inventor Louis Le Prince. While it’s just 2.11 seconds long, it is technically a movie. According to the Guinness Book of Records, it is the oldest surviving film in existence. This 50-second silent film shows the entry of a train pulled by a steam locomotive into a train station of the French coastal town of La Ciotat. It’s a single, unedited view illustrating an aspect of everyday life, and the film consists of one continuous real-time shot. There’s also a an urban legend associated with this movie that says when the film was first shown, the audience was so scared by the image of a life-sized train barreling toward them that people screamed and ran to the back of the room. Oh I shall make a movie! lol, Yeah I was wondering why they decided to make it of a man walking in a circle? I mean of all the cool things you could film, you pick a guy walking in a circle… REALLY? wow you guys don’t appreciate anything do you? Maybe you should put “s around those. Well, it took maybe 6,7 or 8 months, or maybe 1 year, but it depends on how much they tried to advance it. Why are their nombules every Friday? Should be hessiods instead. IT WAS ONE OF THE FIRST MOVIES. like srsly did u expect pink fluffy unicorns dancing on rainbows? Same… I don’t understand why they just made this video 2 seconds long like wtf??? I like the horse one best too it is longer, and in the other one the man just walks across the yard. I can’t understand the part “horse one best too it is longer”. Put in a period. The horse was the first!I agree with Potato! you people should get a grip. It has some flaws but so what. Overall I think it was pretty good for technology back then. Seems like nobody knows when the actual first movie was created? I think the first real narrative film (not just a short) was The Story of the Kelly Gang in Australia in 1906. Whaaaaaaaaaaaaaaaaàaaaat. A horse for 10 seconds!?!?!?!?!? But if you look in the bottom left you’ll see that each frame is numbered and it is running on a loop. Oh I Know What I’ll Do Today, I’ll Make A Movie That Lasts 3 Seconds. I’ve got a great idea, I’m going to make up the best movie ever, I’ll make it 2.11 seconds about a man walking over a yard. My favorite is the horse one. Look at the detail! FYI I’m so glad that they invented movies! Well yes but there are stupid compared to today’s ones. Well, without innovations like these, would we be at our keyboards right now? Well, without innovations like these, we wouldn’t be here talking about them, now would we? We all think that if we were around in cavemen times we would have invented the wheel or discovered fire, but we forget that our brains had not yet evolved. So too with movies. It’s genius that pushes man on! 1902…Trip To The Moon…France…15 mins long. Not so much the short movie is funny, but the ideas man had about the moon back then. I think most of you need to grow up. Do YOU think YOU would have been able to make a film back then ? I THINK (NOT). Why do you think we have the technology we have now ? Because someone used their head and came up with something amazing. If it wasn’t for them back then, We wouldn’t have movies or TV show that we enjoy watching. What have YOU done for entertainment for the whole world to enjoy ? yes! finally someone got it right! the first movie was about the train guys!!! people were so scared when the train came to screen at first that they thought they were in danger and screamed! a woman even fainted. Thankyou though, person. you actually got it right. Ooo look I have a great idea! I’m going to make the best movie in the universe,one that is 3 seconds long and is about a man walking in a circle. what about the moon thing with a cigar in its eye? It’s 2.11 seconds long. I walked out after the first second! just going to say these are amazing. it shows how far weve come in less than 150 years. but the amount of tech they had back then it is absolutely amazing to watch. btw the man is not walking in a circle, the people are actually dancing in the garden. I dont know why but things from a long time ago that are black and white scare me idk why. This website is a lie because there were films made before these so DO NOT USE IT; IT IS RUBBISH!!! Then please explain what the first movie was. Thanks. Exactly the same, 130 years later. Please stop saying, “It was only two seconds,” They were just experimenting, they had to take about 60 pictures to make that and it probably took a long time. The 2 hour movies we have today take about as much time as those 2 second movies took. They didn’t have as good as technology that we have today, I don’t want to start any arguments I’m just pointing out the obvious. GUYS! SPEED UP THE HORSE ONE TO 2x THE SPEED! IT WILL LOOK EVEN BETTER THAT WAY! Oh and by the way, fshrsthejyresbae to you to guys! I think those videos are tests to see if the they would work. I don’t think they were actually watched in movies theaters. Oh and by the way, the FIRST EVER movies that came out (not GIFs like the horse one) were about a train. I think technology is great. I mean really people? Complaining on experiments not good enough at first? Heck life firm in other galaxies are probably laughing at us because our minds are not sharp. Give it a break. :)? Appreciate what they made, because they didn’t have our technology. So what if it’s two seconds long, it was probably one of the best things that happened to people back then. Technology has come so far to think everything coming out now is an improvement on something we already have. For these to be the first movies just think how mind blowing it had to be for people back then to see something like these. Are all these comments from the same person? A lot of people seem confused. The horse “movie” isn’t a movie in the sense that it was recorded on a camera that obtained images sequentially. 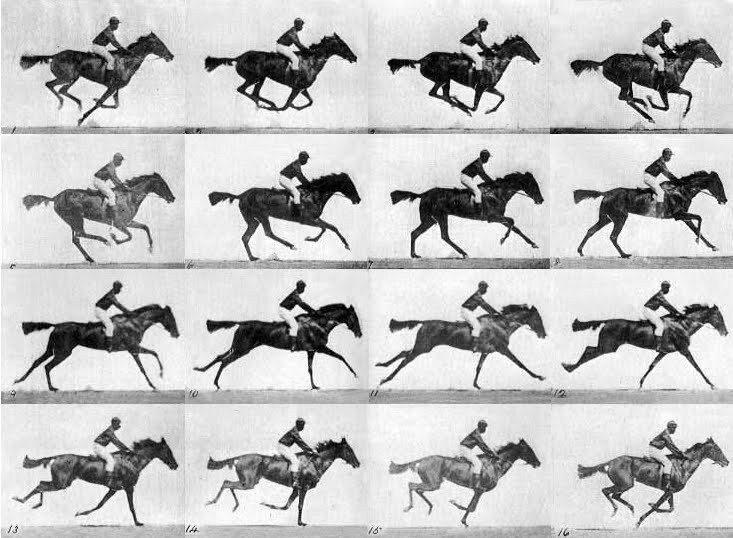 The horse clip is the result of fifteen cameras being set off separately and the images, when put together in sequence, are conjoined in our minds via something called the “persistence of vision.” So it’s more like a flip-book, many pictures in motion, than a motion picture. I thought Cinderella was the first movie. Was it not? For how much they had done in the past and coming up with something like this would be very hard to do more than just 2.11 seconds long. You do have to think about how much they had to go through just to get those 2.11 seconds. I don’t think the people knew they were being filmed and I dought they knew what films meaning was. You also have to understand that they had to use a camera to help them come up with this idea. I think if we had these kinds of people making something like this now just think about what they can do now or even make something was past what we are doing now. I believe we are slow right now coming up with something like this.